TRAVERSING the rugged terrains of Cordillera highlands in a span of one week is an adventure in itself and could be an immense learning experience for someone who has the guts to look down into the depths of mountain cliffs to get a good view of the rice terraces. With tall rice terraces at the backdrop and cool breeze shuttling between mountain peaks, a journey across the Cordillera mountain ranges exposes one to an atmosphere strangely different from the daily offering of Manila and its suburbs. More importantly, it provides a peek into the ancient Philippine civilization before the foreigners came. A group of journalists and regional information officers of the Department of Agriculture crossed the mountains of Cordillera in the third week of March, thanks to efficient vehicles that tracked what could have been dangerous mountain trails and roads under renovation. Twice, our vehicles stopped at Hanselma Highway, while bulldozers were clearing the way to flatten the road. We were lucky it didn't rain. The tour brought this writer to interesting spots in Cordillera – from the hybrid rice town of Tabuk in Kalinga to the rice terraces of Banaue in Ifugao to the scenic village of Sagada in Mountain Province to the vegetable bowl of La Trinidad in Benguet and all the way to Baguio City. Mountain viewing for around 30 hours on travel along zigzag highways is both rewarding and exhausting. This would have been unbearable if not for the comfort of four remote hotels where this writer spent six nights, thanks to the people who made sure we had the best accommodation. An eight-hour night trip from Manila allowed the group to see the beautiful dawn in Tabuk. The modern Dalton Pass at the borders of Nueva Ecija and Nueva Vizcaya significantly reduced our travel time. The national road up to Isabela is actually impressive, except for some bumpy sections that were being renovated. Mang Alex, our experienced driver, was very cautious while entering the Laya Valley in Tabuk, where tales of midnight highway robberies hogged the headlines in the past. Fortunately, the police have already posted checkpoints in the area. While driving towards Kalinga, two things would not escape the attention of motorists, checkpoints being the first. The other is the "Gloria sa Kalsada" signpost at the entrance of each barangay. We thought we could stop thinking politics while in Cordillera. Tabuk is a modern agricultural town, which best exemplifies the use of modern farming equipment and the hybrid rice technology in improving the lot of the farmers. Who would have thought that the Kalingas, who were known in the past as fierce headhunters, would this day lead the country in hybrid rice production? Hybrid rice seeds from Kalinga reach as far as Mindanao. Farmers interviewed by this writer claimed to have been earning more than P100,000 from each hectare prepared for the production of hybrid rice seeds (F1) in just one cropping season. The Laya Valley, for one, is a vast expanse of green crops magnificently bordered by rolling hills that extend up to the Cordillera peaks. This is rivaled only by the rice farms in Roxas, another hybrid rice town in Isabela, which is fast emerging as the food hub in Luzon. From Tabuk, our group proceeded to Banaue the next day. This gave us the chance to witness the agricultural might of Isabela, which covers a total area of 10,664 square kilometers. We stopped over at Santiago City to get some ice cream and soft drinks while observing the economic activities in the area. The way to Ifugao is via Bagabag in Nueva Vizcaya. From there, the vehicle began its climb towards the capital town of Lagawe. Although navigable, the roads to Banaue would test the skills of even the most able drivers. The unwritten rule there is to slow down or stop to give way to the approaching vehicle on ascent. It took us almost five hours to reach Banaue from Tabuk. While the way to Banaue Hotel would provide partial views of the rice terraces, our hotel room, which does not require air-conditioning, has a full view of the mountain peaks and the terraces below. The town center can also be seen afar. The Ifugaos belong to three cultural groups, namely: Tuwali, Kalanguya and Ayangan. Many of them speak English fluently. They are courteous to strangers, yet proud of their identity. However, many of them live in subsistence level, owing to the small size of their rice farms and poor yield. An average Ifugao farmer owns one-fourth of a hectare that produces only 500 kilos of palay (unmilled rice) in every six to eight months of cropping season. 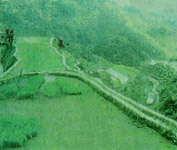 The famous Banaue rice terraces can be best viewed from the viewing deck of Barangay Viewpoint, some 1,200 meters above sea level. The area is also near souvenir shops that sell traditional Ifugao weaved items and woodcarvings. Another good place for sightseeing is Barangay Hapao in Hundungan town, which provides the widest view of the rice terraces. The spider web formation of the terraces can also be viewed from the same town. After two days in Banaue, our group embarked on another five-hour journey to Sagada in Mountain Province. When viewed from the mountain peak, the road is like a white thread that measures the length of the mountain ridges. It is hard not to have a stiff neck while marveling at imposing mountain peaks that kiss the clouds and realizing that the road actually leads there. One way of knowing that we have crossed the border of Mountain Province is the appearance of Pine Trees. American missionaries reportedly encouraged the people to plant Pine Trees in the area nearly a century ago. To this day, traces of American influence remain in the capital town of Bontoc, which is sandwiched by mountain peaks. On the way to Sagada, our convoy could not help but pause to get a good look at villages nestled in the mountain, with idyllic rice terraces strategically located nearby. With an elevation of 1,500 meters above sea level, Sagada is like Baguio City minus the trappings of commercialization. One warning for Sagada visitors is that establishments close shop at 9 in the evening. Visitors are also expected to follow rules strictly in the area. Likewise, taking a bath in the early morning is discouraged, especially when nobody who can heat the water is already awake. But what made our trip to Sagada is a two-hour trek into Sumaging Cave, which showed us the beauty of natural resources underground. The extraordinary stone formation plus the crystal clear water that drips slowly into the deeper parts of the cave awakened the most appreciative senses in us. The trip from Sagada to Baguio took all of seven hours. During this time, we were entertained by unparalleled mountain sceneries and cloud movements that touched the Hanselma Highway. The rice terraces in the area are taller, extending up to the mountain peaks. Such terraces, however, could not be sustained by irrigation. We had our lunch at the picnic area of Mount Data Hotel, which is situated some 2,300 meters above sea level at the border of Benguet. Mount Data is the next highest peak to Mount Pulog, which rises around 3,000 meters from the sea level. The vegetable terraces in Atok, Benguet is also incomparable. The vast expanse of the area provides a clue on how deeply Benguet is dependent on the vegetable industry and how many people in the province lost their livelihood following the influx of cheaper Chinese vegetables. Benguet vegetables are brought to La Trinidad and Baguio City, the major trading posts in Northern Luzon. From these areas, these vegetables are transported to other parts of Luzon, Metro Manila in particular. After seeing the higher parts of Cordillera, one succumbs to the trouble of not appreciating Baguio City at all, because it is crowded and noisy. Of course, there is still Camp John Hay, but the area is fast becoming the playing ground for the rich. As a participant in the Economic Journalists Association of the Philippines annual seminar, I stayed at the posh Manor House for two nights. Yet, my mind was still in Banaue and Sagada where the wind was purer and the song of the night calmer. The guest speakers in the seminar talked about banking and monetary policies, as if they were the lifeblood of the economy. The farmers, however, think otherwise. "The real economy is what you see outside Manila. It is what you see in the farms, in the mountains, in the seas. We are hoping that the next president will go here, so he will know our real economy," one farmer said. For one, Cordillera offers a glimpse of the Philippine economy rich with opportunities waiting to be tapped.